I kept the basic quantities in the recipe. 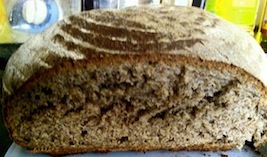 I have promised my husband no seeds in bread for few more days, so I settled on brown flaxseed meal. I was not ready to use flaxseeds without any pre processing. Used 100 gms flaxseed meal and made a hot soaker with 100 gms water. Kept it in warm oven for 4 hours. Decided for RYW levain instead of IY. 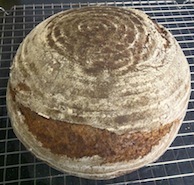 Along with soaker, made a RYW levain of 50 gms WWF & 50 gms RYW. The next question was to knead or not to knead. The more I thought over it, kneading seemed to be a better way. Kneading is delegated to my BM as it kneads better than me (or so I tell it to make it feel motivated). After 4 hours, the levain was ready. I dumped the levain, soaker, 200 gms BF, 2 tsp agave nectar, 1 tsp salt and 100 gms old refrigerated stock of RYW in BM and set it on dough cycle. I did not consider the water in soaker in my final hydration. Decided to add extra flour if needed. But did not need - the dough was beautiful as is. Soft, tacky and extremely easy to work with (ok so my BM did most of the hard work in the first half, but still it was a pleasure to watch the dough being kneaded). Checked after kneading was done to see if extra cycle was in order but it was good to rise. Did bulk ferment in BM itself. Looking at the dough after kneading was done, I was expecting a decent rise, but knowing the high amount of flaxseeds, would have been happy with anything between one and half times to double. At the end of dough cycle, it had more than doubled. Happy time. RYW, flax seed and WW sure looks like a great combination. You did an good job with thsi bread inside aand out. Thanks, dabrownman, for your kind words. I have flax seeds and flax seed meal but have nto used either yet so you are reminding me to give it a try soon. Thanks a lot, Ian. I am sure all your exotic flours will give flaxseeds the extra boost. After working with flaxseeds as main ingredient, I realised it is one of the most forgiving ones. The dough looked like it could withstand a large margin of both hydration and kneading on either side. Nice bake! I love using flax seeds in baking. Toasted, they have such a surprisingly pronounced nutty toasty flavour. Lots of punch in those little guys. Thanks, John. I have not used toasted flaxseeds in bread. Next time will give it a shot.